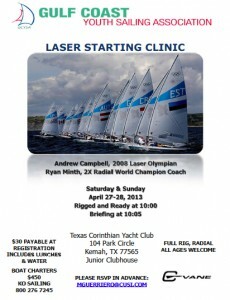 Now, for a departure from Laser politics, let's try something sailing related. About time, huh Dave? Dave doesn't want history, geography, pop quizzes, politics, etc. Just teach him how to sail his Laser faster. At the recent starting clinic we attended, Andrew Campbell asked 'how many people get a line sight before the start of the race?' Many did. Then he asked, 'how they do that?' The standard way. Then he asked a darn good question. Ok, you have a line sight that tells you when you're on the line, 'what good does it do you?' It's 30 seconds before the start, boats all around you and you see from your line sight that you're on the line and, essentially, hosed. Yep, pretty much sums up my starting experience. So, he asked, how many of you have a line sight that is two boat lengths behind the line? When you hit that line sight, you can still do something about it. Why the heck didn't anyone ever tell me that before? That's a line sight with information and options. Even after he told us, it took me a minute to follow his diagram with the early line sight being further up the course than the 'on the line' line sight and then the light went on. Yes, I'm that slow when it comes to geometry. That tip right there was worth the price of admission. Then, Ryan Minth talked about NSTASLNSTASG - 'no such thing as start line, no such thing as start gun.' Pretty much Doug's way of starting. Doug doesn't wear a watch and he doesn't care where the start line is. He lets everyone else keep time for him and he lines up next to them and when they pull the trigger he goes too. All he is trying to do is win the start with the guys right next to him. I had to laugh when Andrew asked what happens when you line up with a guy that's doing the NSTASLNSTASG and you're keeping time? They are only trying to beat you and don't care what time it is. This happened with Doug when sailing a Radial with the juniors last year at the Laser Nationals since they had the better turnout. Doug didn't pull the trigger and this poor girl says to him, 'please sir, can we start now?' Doug had no clue it was time to go. So, knowing the starting techniques of those beside you is fairly important. As in stay away from non-watch wearers. And if you start next to Doug, he counts in his head so talk to him and start a different countdown out loud and confuse him. There you go Dave. That's your go fast, beat Doug off the start line tip. Ryan said the main goal of the weekend was to be uncomfortable and make mistakes. We did port starts, starboard starts, late starts, early starts, long lines, short lines and super short lines. I achieved the goal with flying colors. Didn't know if I was Arthur or Marthur half the time. So funny. I've been doing NSTASLNSTASG for decades and had never heard a coach teach it before. Always felt that I was dumb because I could never see the pin to check my line sight without getting so far ahead of the boats around me that I would be OCS. Well, if it's good enough fro Ryan and Doug it's good enough for me! Well the 2 BL line site can be a problem if you are fairly far from shore in that you really need 2 object on shore to line up. in some ways a better alternative is what surfer's call a "lineup" for 10 seconds close hauled to the RC, the Pin and the middle to both ends. takes a bit of time to get. so if you can't get all three, get the Favoured end and the middle to the pin. Tom Slingsby - Good, Clean Fun! Laser Trademarks Up for Grabs?